New Delhi: July 28, 2016: Nando’s, the South African based international chain of casual dining restaurants serving Afro Portuguese cuisine,hosted National Grillers’ Challenge 2016 at Nando’s restaurant in Cyber Hub, Gurgaon. The National Grillers’ Challenge is an annual event which is one of the most engaging and inspiring internal events of Nando’s to motivate and appreciate the grillers, fondly called as ‘Nandocas’. After an intense competition among the top grillers from Nando’s New Delhi, Chennai, Punjab and Bangalore, the National Grillers’ Challenge was won by the hard working, immensely skilled and warm natured Mr. Kunwar Singh from Delhi. Kunwar received the ‘Coveted Griller’s Machado’ and a trendy G-Shock watch. He will now be going to Kuala Lumpur, Malaysia, to represent India in the International Grillers’ Challenge, competing with Nandocas from over 16 countries. Winning Nandocas will also be treated to a fantastic array of events while in KL City, including a special gala dinner and a tour of the cultural city. Nando’s Grillers or ‘Nandocas’ battled it out in their respective‘Regional Grillers’ Challenge in the first week of July. The winners were flown to New Delhi for the National Challenge along with the Patraos (Managers) of their respective restaurants. They were taken for a fun-filled Delhi tour, gaming activities and of course, a gala party that followed the challenge. The day of the main event had a red carpet welcome for the grillers. The competition saw four finalists take to the grill, cooking a whole, fresh chicken to perfection and adding sides before serving it to a panel of eminent judges, including Corporate Chef of Kohinoor Foods – Shamik Mondal, food connoisseur and COO of Alchemist - Neeraj Malik, Master Trainer and Director of Passion Foods – J. S. Uppal, and 2 internal Nando’s judges. The judges were asked to rate the chicken on the basis of perfect browning of skin, visible grill marks, cutting of the chicken, basting, tenderness, juiciness, clean plate and overall brand fitness. 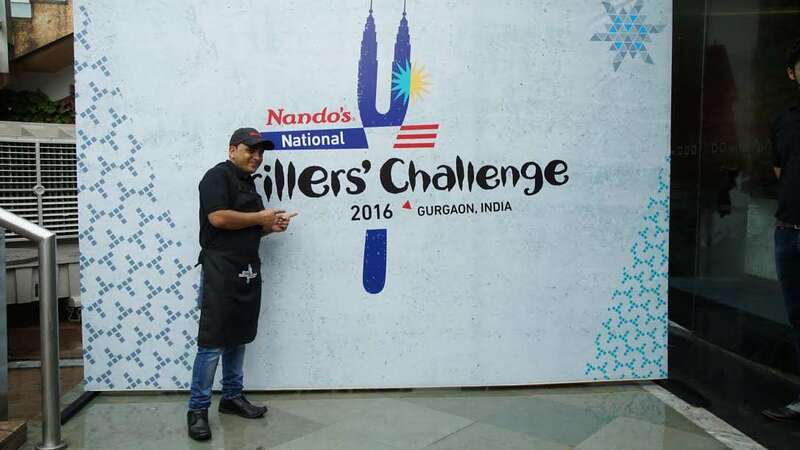 This year’s National Grillers’ Challenge was a great extravaganza, with the restaurant closed for regular walk-ins, as not only the Grillers but also Nando’s loyalists and eminent personalities were invited to witness and be a part of the celebration of Grillers’ Challenge with Team Nando’s. The evening saw Nandocas and other guests dance to the beats of ‘Earthy- Fola’. Nando's is a South African global chain of restaurant serving Afro-Portuguese cuisine and is known world over for its flame-grilled PERi-PERi chicken. Nando’s chicken is marinated for 24 hours in PERi-PERi sauce so that the flavor goes right to the bone. The first ever Nando's restaurant opened in 1987 in Johannesburg, South Africa. This was a venture by two friends, Robert Brozin and Fernando Duarte. Their vision to take the best tasting chicken to the world, was answered through 1200+ Nando's restaurants across 5 continents and over 20 countries. The Nando's symbol, the Barcelos Cockerel, remains the most visible expression of Nando's passionate pursuits. With over 1200 restaurants worldwide, Nando's is present in countries like South Africa, Australia, UK, Bangladesh, Bahrain, Botswana, Canada, Fiji, India, Ireland, Malaysia, Mauritius, Namibia, New Zealand, Oman, Pakistan, Qatar, Swaziland, UAE, USA, Zambia and Zimbabwe. Currently Nando’s has 8 restaurants in India spread across Delhi, Punjab, Chennai and Bangalore with big expansion plans in near future.